A pervasive email campaign has been making the rounds to nominate the Taj Mahal as one of the new Seven Wonders of the World. Over 3 million people visit the Taj Mahal every year- that’s about 8000 people a day. Most of them get on a filthy train or stinky tourist bus from a distant location, fight a barrage of people, drink in automobile fumes, among other odors, and arrive dusty and derelict and consumed with frustration and fatigue at the first vista point. When they finally set their eyes on the “Miracle in Marble”…..it takes their breath away. The Taj is a flawless creation, probably the most wonderful manmade structure I have ever seen. However, if it were not for the one more obligatory trip I must make to see it with my son, I would be loath to brave another visit. This is true of almost every tourist destination in India. Appalling restrooms, unhygienic food, unreliable transport, unsafe roads; yet at the end of the tunnel is beauty like you cannot believe. Having traveled extensively in India and also in Europe and the United States, I cannot help making the inevitable comparison. In the US, every monument from border to border is admirably preserved. Well appointed restrooms, impeccable roads and the obligatory gift shop. Whether it is the Lincoln Memorial or the Bunker Hill monument, whether it is Alcatraz or the Mystery Spot, you go away clutching your newly acquired T shirt and fridge magnet feeling you had a complete experience. You can respond without hesitation if nature beckons, and relatively speaking, you are not jostled by the crowds or hustled by the guides. I remember visiting the Carcassonne Castle in Southern France, about twice the age of the Taj. It is a walled city atop a hill, a couple hours from the border of Spain and about 10.5 hours South of Paris. As you approach it, you are impressed by its majesty. You are amazed at its size. It is beautifully preserved, the sights and sounds inside with the street musicians and mock fencing matches are designed to transport you back to its own era. It is an impressive sight, but nothing compared to the Taj. Still, I will go there again if I have the opportunity, simply because it’s easier on the senses. Yes, the common man in India has other, more pressing priorities. In a country where some 26% of the people are below the poverty line, don’t you think a few of them are going to pester you for the change you have in your pocket so that they can feed their family? Do you think they care that the tumbledown, ramshackle hovels they call home are marring the skyline? Does it make a whit of a difference to them that the love offering that a Mogul emperor made to his favorite queen is yellowing and needs several mud baths to be restored to its original state? And yet, I could cry at the thought of the good tourism dollars we are throwing away because we cannot get our act together. Those very same dollars (if you discount the deep deep pockets of the ubiquitous middlemen) could alleviate many of the needs of India’s “huddled masses” and at the same time pay several times over for the upkeep of those precious heritage sites. Call me shallow but I long for the time when Indian tourism will not bring to mind Delhi Belly, Malaria pills, in your face crowds and advice from the once bitten – “Whatever you do, don’t drink the water”; when the airport will be a little more inviting, the roads less bumpy and the air more invigorating (or at least a more neutral odor). I long for the day when I will be able to take my son on a clean and comfortable rail journey from Kashmir to Kanya Kumari and show off every inch of my beautiful country….. but I will not hold my breath. For now I am just going to vote for the Taj. The organization conducting the poll is the N7W(New 7 Wonders) foundation created by Swiss adventurer Bernard Weber in 2001. Last year 21 manmade structures were short listed and the Taj was one of them. The Seven New Wonders of the World will be announced at the Official Declaration ceremony in Lisbon, Portugal on 07.07.07. Cliché or not, the Taj is the trademark of India, synonymous with our country and vital to our branding. According to the Hindustan Times (May 18, 2007), the Taj needs another 300 million votes to make it to the top of the list. A.R Rahman is apparently composing a special anthem campaign to spread awareness for the event and to increase the numbers. I took the time to vote in Sanjaya Malakar for American Idol, so I can definitely commit to a two minute phone call to endorse the Taj as my choice for the N7W. Will this wake the Indian government to show a little more respect for this monument? I don’t know. To vote by phone, call +423 663 90 02 99; +44 870 062 3748; Quote Code 20 for the Taj. 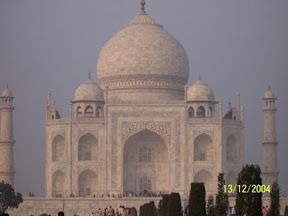 This entry was posted in Travel and tagged India Travel, taj mahal on June 24, 2007 by vpdot.